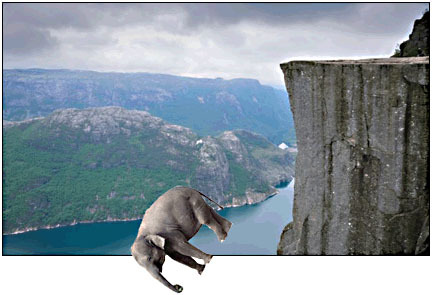 How Scared of the Fiscal Cliff is Big Business? that the Republicans on the Hill are so stupid, stubborn, and cowardly that they need to be told. I was musing about this with a friend just yesterday. Right now there’s a strong sense that corporate America is genuinely scared about going over the fiscal cliff and sparking another recession. That’s bad for business! On the other hand, the rich people who run corporate America don’t want their tax rates to go up. That’s bad for their bank accounts! Plus, as Mark says, they really seem to have drunk the “Obama hates business” Kool-Aid. So what happens? Do they give into their hate and their pocketbooks and stay on the sidelines? Or do they do what’s best for their companies and put some heat on Republicans to make a deal? I genuinely don’t know which way the corporate frog is going to hop on this one. The trouble with this analysis, it seems to me, and with the Obama administration’s current bargaining position, is that Speaker Boehner has already conceded that he is prepared to raise revenues. So I don’t see why Chait is insisting he hasn’t. I think Chait is right. During the debt limit negotiations last year, it turned out that the only additional “revenue” John Boehner would agree to was revenue that we get automatically from economic growth. But this was fairy dust revenue, not a real concession. This time around, Boehner has made vague noises about closing “deductions and loopholes,” but so far he’s been emphatically unwilling to actually name any of the deductions or loopholes he’d be willing to close. Until he does, he hasn’t conceded that he’s prepared to raise revenues except in a cheap rhetorical sense. I’ll believe Boehner is serious as soon as an actual proposal is on the table and both Eric Cantor and Paul Ryan say they’ve signed onto it.